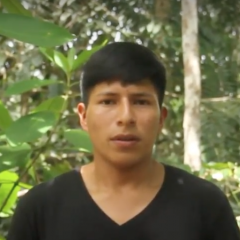 Ronny Avilés is a member of the Kichwa Peoples of Sarayaku located in Amazonian Region of Ecuador, and which has held long fights at a national and international level to stop extraction projects in their territory. The following is a transcript of the video of Ronny's comment of the word cloud for the term “Kawsak Sacha,” (Living Forest) which is a way of life to live together with nature. I chose the word cloud of the word Kawsak Sacha (Living Forest). Sarayaku is not only about struggle, it also has diversity such as its flora, fauna, the spirits that protect us and that live in the big lagoons, rivers, mountains and trees. That’s what Sarayaku has, and that’s what we would like to appear in this word cloud.